Congratulations to the 2018 Winners of Glaser Orthodontics $500 Scholarship! We at Glaser Orthodontics believe the greatest investment one can make for our children is for their education. To commemorate our dedication to the youth of our community, Glaser Orthodontics is awarding two (2) $1000.00 Scholarships to graduating seniors with plans to enter a health profession. Applications will be accepted from Soundview Prep School, Croton, Haldane, Hendrick Hudson, Lakeland, Walter Panas, Peekskill, Yorktown, Ossining and Putnam Valley High Schools. To compete, you must submit a completed application, senior photo and a signed release form. Your application must be returned to Glaser Orthodontics. This October, Glaser Orthodontics proudly supported the ongoing efforts of Support Connection, a local non-profit that provides emotional, social and educational support to women, their families and friends affected by breast and ovarian cancer. Through our second Annual Initiative, every time a patient requested pink decorations on their appliances or came to their appointment wearing pink, Dr. Glaser made a donation. Thanks to their efforts and the generosity of Glaser Orthodontics, Dr. Glaser presented $2500 to Support Connection. We look forward to expanding our efforts and making a greater impact next October!! 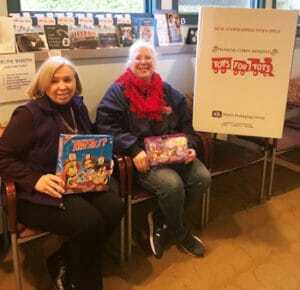 Glaser Orthodontics participated in the Toys for Tots Program this year by hosting a toy drive during the holiday season to help provide the less fortunate children in the areas with gifts to unwrap. Local Toys for Tots Campaigns are the heart and soul of the Marine Toys for Tots Program managed by dedicated United States Marines and local volunteers. Local Campaigns are the best source of Toys for Tots information on how to give and receive support in your community. Over 97% of the donations to Toys for Tots goes directly to their mission of providing toys, books, and other gifts to less fortunate children. The 3% spent on support principally covers fundraising expenses — not one donated dollar goes to salaries or any other manpower costs. Thank you to our patients for their donations! Glaser Orthodontics participated in the Operation Gratitude Program this year by hosting a candy drive right after Halloween. Operation Gratitude delivered over 20,000 care packages to deployed troops around the world during the holiday season. Since it’s inception, Operation Gratitude has delivered more than 2.1 million Care Packages filled with items donated by grateful Americans and service-friendly companies that want to express their support for Heroes serving overseas and here at home. Operation Gratitude strives to bridge the civilian-service divide. Thank you to our patients, and local boy scout troops for their donations! Glaser Orthodontics was pleased to welcome Jim Witt to our office! 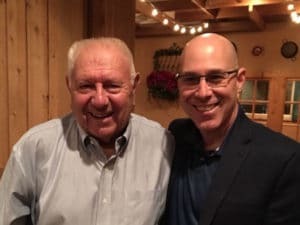 Dr. Glaser presented Jim with a check in support of the Hope for Youth Foundation, which assists children who are mentally and/or physically challenged, or who are ill or disadvantaged. HFY also supports youth programs which facilitate healthy growth whether it is academic, emotional or athletic. Thank you Jim for giving us the opportunity to support such a worthwhile cause!! The orthodontic field is full of opportunities. Each career choice is personally and professionally satisfying. In each you’ll be a member of a special team which produces better oral health, enhanced self-esteem and beautiful smiles. Please remember such rewards as you consider a career in orthodontics. All orthodontists are, first of all, dentists, but only about six percent of dentists are orthodontists. Admission to orthodontic post-graduate programs is extremely competitive and selective. It takes many years to become an orthodontist. As in medicine, the educational requirements are demanding. First, an orthodontist must complete college. Next is a three- to four-year graduate program at a dental school in a university or other institution accredited by the American Dental Association (ADA). Finally, there are at least two or three years of advanced specialty education in an ADA-accredited orthodontic residency program. The program is difficult. It includes advanced knowledge in biomedical, behavioral and basic sciences. The orthodontic resident learns the complex skills required to both manage tooth movement (orthodontics) and guide facial development (dentofacial orthopedics). Only dentists who have successfully completed this advanced specialty education may call themselves orthodontists. For more information on orthodontics and on careers in orthodontics, talk with your orthodontist.